General Electrics such as your car’s battery, starter motor, alternator, lights and even wiring used to be very basic part of auto electrics, now things have become much more complex. 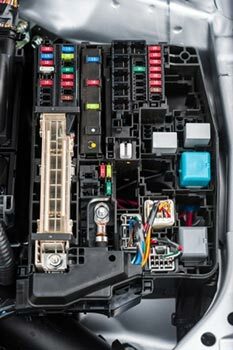 Did you know that a modern day car could have miles and miles of electrical cable sending current to all components as well as lots of different computers sending and receiving vital information about how the engine is performing. Sometimes even though cars and vans are very complicated it could be a very basic thing that can cause a problem with your vehicle. That’s why at Greenaway although we pride ourselves at being a very modern workshop we always start with back to basics approach to auto electrics. After all why spend your hard earned cash on an expensive repair that might have just been a flat battery in the first place! As well as basic fault finding such as wiring repairs, battery checks, earth connections, fuse checks, bulb replacements, connection problems, changing system revisions and so on. We also diagnose and repair other auto electrical faults such as central door locking, electric windows, wash wiper systems, heater motor repairs, car air con repairs, car lighting system repairs, cigarette lighter faults, car audio faults, sunroof faults, convertible roof faults, electric seat faults, heated seat problems, parking aid faults. All of these faults can be controlled by a BCM (Body Control Module) which can be easily damaged by for example jump starting your car if the battery is flat. So be careful and leave all your auto electrical needs to the experts Greenaway Auto Electrics – The Right Choice.